The idea of our community began in 2001 when architect Giles Blunden, a resident of Carrboro cohousing community Arcadia (link) and other interested people decided to create a cohousing site closer to downtown Carrboro. The community celebrates its anniversary on May 1, 2006, the date the first homeowners moved in. Features include two rainwater cisterns (5k and 15k gallons), organic community gardens, passive solar design, and solar hot water and radiant floor heat in many units. All homes meet Advanced Energy Corp “System Vision” green building specifications. 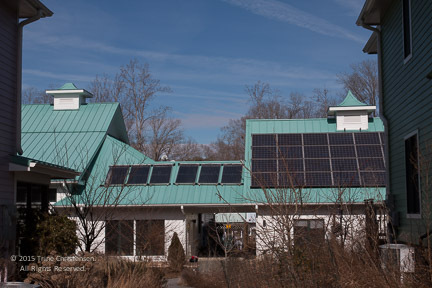 Among Pacifica’s many environmental features, our Common House has the largest residential photovoltaic solar array in the Triangle. Pacifica Cohousing is a community of 46 homes working together to create living spaces that offer both privacy and community, as well as shared values of safety, mutual concern and responsibility. We are guided by the principles of community, diversity, sustainability, and affordability described below. Cohousing is intended to foster neighborhood connection and responsibility through design choices, shared resources, and participatory decision-making. Pacifica, like most cohousing communities, uses a consensus-based decision-making model designed to foster positive relationships and increase the well-being of the community. Cohousing originated in Denmark and spread to the US in the 1980s. 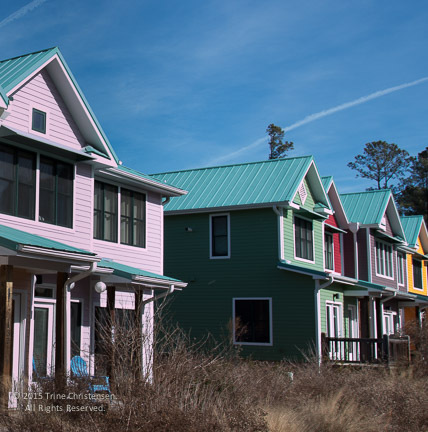 Worldwide, there are now hundreds of such intentional living communities, and as of 2018 there are at least seven in the Triangle. The Cohousing Association of the United States ) provides information and guidance for new and established cohousing communities. It identifies interpersonal relationships, a balance of privacy and community, participation, and shared values as common cohousing characteristics. Site design includes bio-retention areas and a pond for storm water management to protect nearby Bolin Creek. Unpaved overflow parking and pervious pavers used for sidewalks. Passive solar design and highly energy-efficient design for all buildings. Minimum site lighting to reduce night sky radiation. Bicycle accommodations, including covered storage and repair areas. All parking is around the perimeter of the community to create a safer and quieter area where for children to play and for residents to socialize. The common house uses cistern water, solar hot water collectors and a photovoltaic system that sells power to the local utility. Thoughtful landscaping that favors native, pollinator-friendly plants. The guest house includes three bedrooms and two bathrooms for community visitors, and an office for community business. There are two large community gardens and a large play field. Residents organize regular community meals and other social gatherings in the Common House. Our HOA is supported through monthly dues as well as community labor. Our neighbors are welcome to use the play field and to access trailheads on the edge of Pacifica’s property. Our homes consist of attached townhouses, stacked houses, and a few stand-alone houses. Residences range in size from 600 sq. ft. to 1460 sq. ft., accommodating a range of income levels and household sizes. One custom unit was designed for accessibility. Pacifica embraces residents of all types. Seven units are sold and managed through the Community Land Trust. Community-owned resources, such as Guest House, laundry room and internet network, allow residents to purchase smaller dwellings and keep costs low. Expensive tools and other equipment can be jointly owned or shared by neighbors, including kitchen appliances. Shared responsibility for the maintenance of our community is an important part of Pacifica. Community labor strengthens social connections and provides a range of ways for residents to contribute to the health of the community. Each household contributes a minimum of four hours of community labor each month. Community labor can be completed on residents’ own time or during community work days. Held on the second Saturday of each month, community work days are when we join forces to complete larger projects such as landscaping, cleaning, and repairs.